As is true with much of modern society, the digital age has replaced the traditional artistic mediums with faster more instantaneous techniques. Our fast paced life is mimicked in every aspect of our daily routines with little or no time to devote to handcrafted items anymore. So, when a traditional often forgotten service comes along, we tend to take notice and appreciate the fact that there are still individuals among us who take the time to create something special and unique. Case in point, Marius Kulikowski at 3D Portraits in Mississauga ON, is doing just that. They are bringing old school techniques to a modern world with their sculptures. That's right, what was once reserved for the wealthy and affluent members of society is now available to everyone. They are 100% accurate likenesses of you based on a photograph. They can be created in plaster (available in a variety of finishes) or engraved within beautiful crystal. They are intended as special gifts that are meant to be passed along as heirlooms for families to enjoy for years to come. You can have them made in any size you like ranging from the very large to the small. 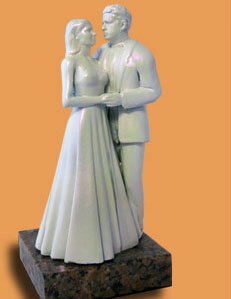 Preserve your and your fiancé's images in a special, one of a kind sculpture and use that sculpture to adorn various parts of your wedding. 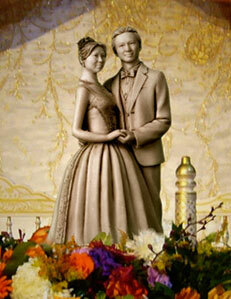 For example, a beautiful cake topper can be made just for you! Or, wow your guests further by placing a photo crystal (crystal with your photo engraved in it) with an LED base at the reception's entrance. 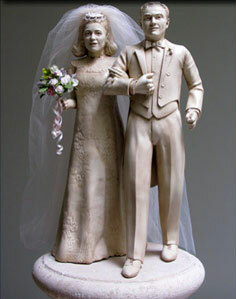 If that is not enough, why not consider sculptures of the two of you at the head table or as centrepieces on each guest table? Planning a wedding can get very involved with all the details necessary to satisfy you and all your guests. As a result, we are often left with an event that covers all the bases but in the end, is just like everyone else's. 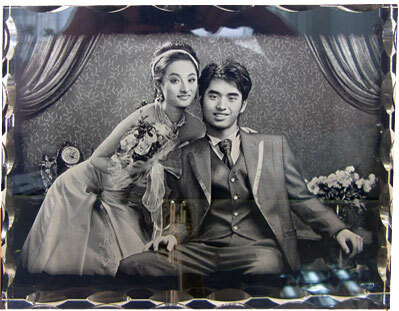 Thanks to companies like 3D Portraits, we are offered a rare opportunity to take advantage of a truly unique service and to have it help create a one of a kind wedding!